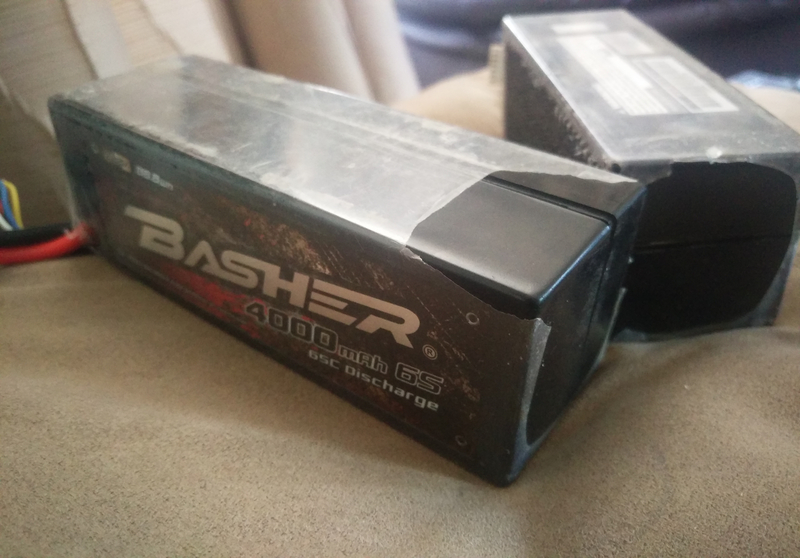 After just under a years use, I have two bulging Basher 4000mAh 6s batteries. Like I said this is my first experience with this situation so please bare with me. Now, originally these were listed as LiHV but im now panicking that this isn't the case. They are used in the Berserker with XT150s and charged using the Overlander RC6-VSR, using either the Balance or Fast charge mode, but neither will charge above 3.6 Amps, so keeping with the 1C rule. As a disclaimer I fully understand usage can severely affect a batteries life and in no way am I 'blaming' Hobbyking for dodgy batteries, but instead asking whether they're still safe to use or whether this amount of swelling is a no no. I have lost count on the cycles they've done, but was hoping they were going to last a lot longer than this. 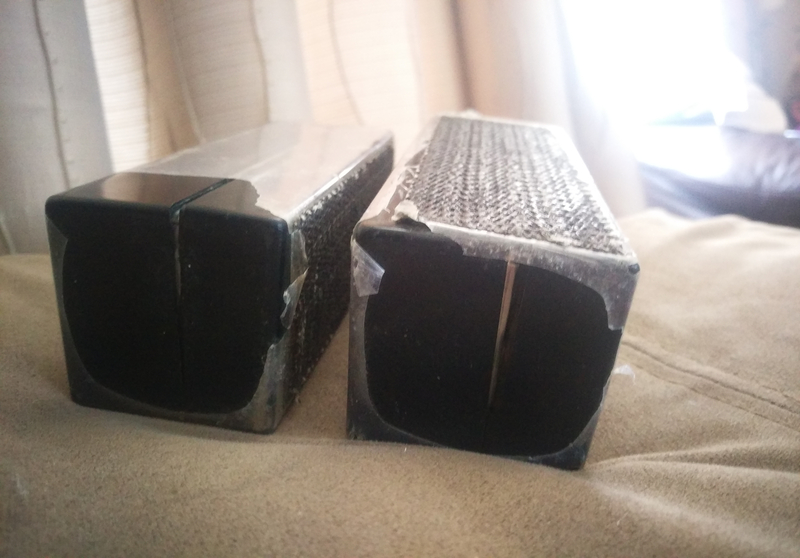 They have only recently split the hardcases they're in and I dearn't charge them until I've asked on here first. They haven't been storage charged yet for the reason I mentioned earlier. I won't go below these voltages after use so it's not like im discharging them to far. All cells seem to be okay, they would get warm but not hot during use. Dispose of them. Fully discharge them, then leave in a bucket of salt water until the cells read zero volts. agghhh, I was scared i'd hear that. thanks for the reply, any idea what could have possibly gone wrong with them? 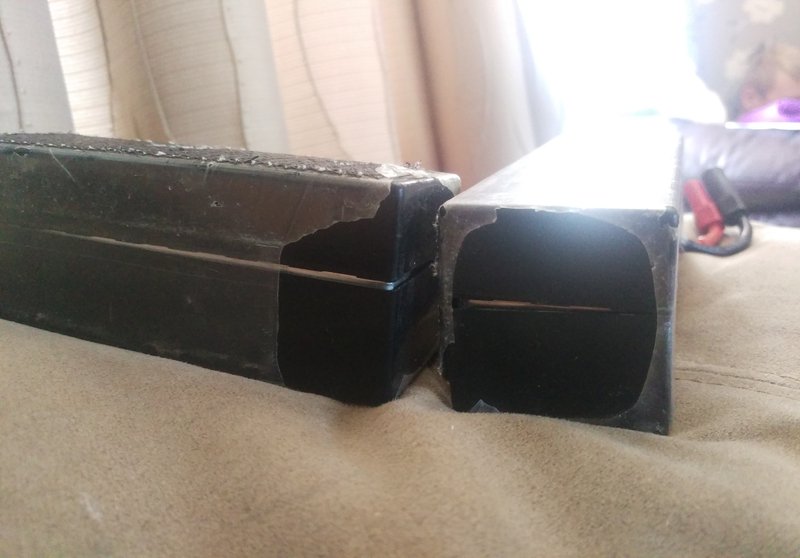 one was bought in July and the other in September so they're not exactly old. Do you have any info on them being LiHV or just LiPo? like i said they used to be listed with the other LiHV Basher batteries but since the website redesign they're not so have they been mis-sold? If so is there anything i can claim back as thats pretty bad on Hobbykings part. There is a few videos showing this i think so its not just me thats been caught out... unless they are LiHV capable and something's gone wrong charger end maybe? Again, thanks for the reply, ill cut off the XT150s, do what you said, then probably pri open the cases to re-use them as well and then get rid of the cells. How much should I discharge them before dunking them? And what other batteries would you recommend? Looked at your pics again... They are not LiHV as suspected - they are marked 22.2V which is nominal for ordinary LiPo. LiHV would be marked 22.8V. I would gently discharge them to 0V or near enough then dunk them in the salt water. Alternatively, if you have somewhere local that has a battery recycle/waste bin, take them there. 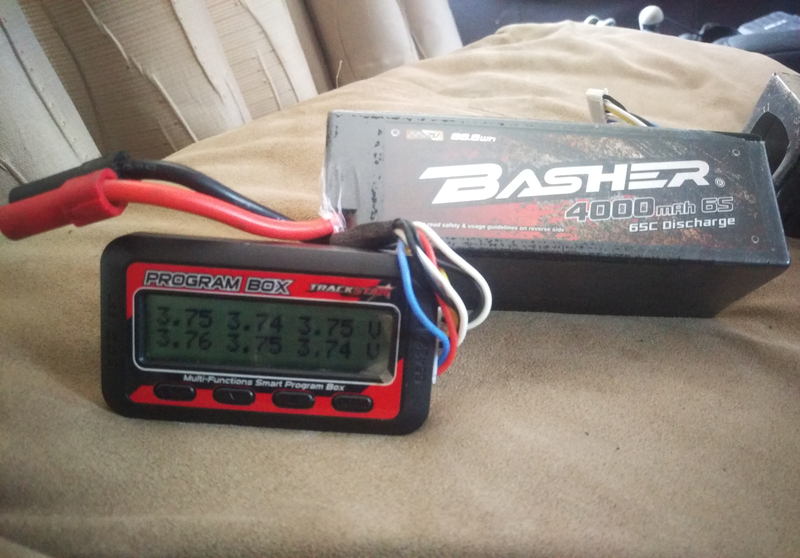 I am not able to give any info on alternative batteries as I have no RC car experience. 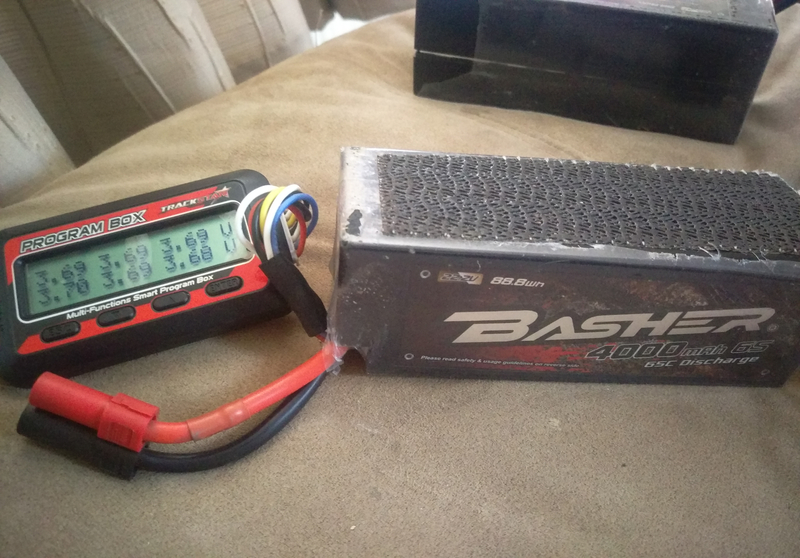 Okay, thanks very much for all the help, im gonna have to get in touch with hobbyking as these were originally listed with the other 2s Basher batteries and I believe there was a 3s as well on their own product page titled "Basher LiHV", which has clearly caught me out and being new to all this I didn't question. I've now looked on the newly done website and its only the 2s batteries listed, so hopefully they'll own up and help me out a bit, just fairly annoyed I didn't get any proof like screenshots or pictures. Même problème pour moi. Trois jeux morts !!! Supposedly the gas in the pouch is oxygen and I have made small punctures in the pouch corner to vent the gas out and continued to use the battery until the internal resistance gets too high then retire it. So far in all my batteries I only have had NiCad AA cells spurt fire and NiMh F cell get hot enough to give off smoke ... Just be careful when charging. It is oxygen amongst others. But, please avoid what JanComputerman does with puffed cells. Whilst it is not an everyday occurrence, puffed lipos can, and do burst and rarely suffer thermal runaway and do burn. Never worth it. Not for a few £ worth of batteries.